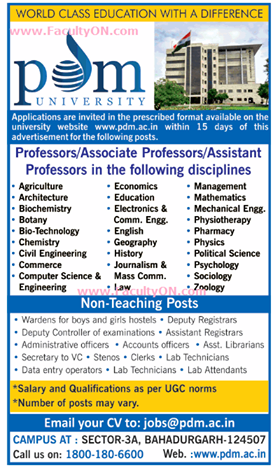 PDM University, Haryana has advertised in TIMES OF INDIA newspaper for the recruitment of Professor plus Associate Professor plus Assistant Professor job vacancies. Interested and eligible job aspirants are requested to apply with in 15 days. Check out further more details below. About College: The PDM University has been established by the Haryana State Legislature under the Haryana Private Universities Act No. 32 of 2006, as amended by the Haryana Private Universities (Amendment), Act, 2015 (Haryana Act No.1 of 2016) and notified in the Haryana Govt. Gazette (Extra) Notification No. Leg.2/2016, dated 14th January, 2016.